The Radial Headbone is an advanced amplifier switching device that allows two different guitar amp heads to be used with a single speaker cabinet. With the Headbone, one head could be used for rhythm while a second head could be used for soloing. With 100% discreet Class-A circuitry and choice of either buffered or un-buffered inputs, the Headbone will be of particular interest for players that demand the utmost in tonal performance. The Headbone's internal switching comprises a sequence of relays, photocells, and load resistors, all of which are controlled via a digitally programmed chip. Hit the footswitch and the Headbone toggles the guitar signal from one amp to the other, disconnects the speaker and diverts the signal to a load resister, reconnects the speaker to the second head and turns on the guitar, all in quick succession. The Headbone features SafeMode whereby even when power is disconnected; the Headbone will automatically default to 'head-1 to cabinet' status, ensuring a constant load on the amplifier. Headbone comes equipped with Slingshot, an easy-to-use switching system that uses any standard footswitch to toggle the Headbone's status remotely, from wherever the footswitch is located. Slingshot lets you keep the amp-to-speaker cables short and efficient and opens up new switching possibilities too. 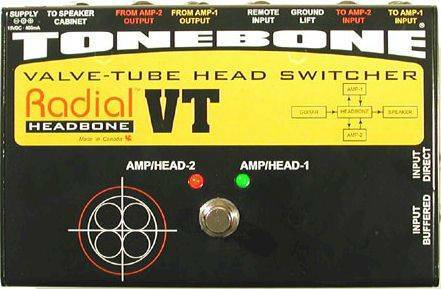 The Headbone is available in 3 models: The VT for two valve/tube heads, the SS for two solid-state heads and the TS for tube to solid-state amp head switching. Headbone another Radial 'power tool' for serious guitarists. This is a fantastic piece of equipment. It works so well on so many levels. The buffered input boosts in a very transparent manner. Luv my Headbone!